If you are a truck driver chances are you have heard of Sleep Apnea but you do not know exactly what it is. I will try to enlighten you from my own experience of what Apnea is and how to get diagnosed and get treatment. Let me tell you my symptoms and you can see if they apply to you. I would take my normal break after driving my truck an sleep for 8-10 hours. I was getting up 3-4 times a night to urinate, always tossing and turning and waking up tired. I would drive and need a nap after a couple of hours. Everything made me drowsy, a meal, driving with the sun in my face, reading a book or magazine. At the time I didn’t know that these were symptom of apnea. I thought my urinating problem was a prostrate problems or just drinking too much during the day. I finally went to my doctor where he recommend I get a Sleep Study Test. He explained to me that apnea is a potentially serious sleep disorder in which breathing repeatedly stops and starts. Apnea disrupts blood flow to your brain, which causes the blood pressure within the brain to elevate. This may explain why people with apnea are more likely to suffer stokes and die in their sleep. You may have apnea if you snore loudly and you feel tired even after a full night's sleep. Apnea usually occur during sleep. When an apnea occurs, sleep usually is disrupted due to inadequate breathing and poor oxygen levels in the blood. Sometimes a person wakes up completely, but sometimes this can mean the person comes out of a deep level of sleep and into a more shallow level of sleep. An not getting the proper rest. Apnea occurs in two main types: obstructive apnea, the more common form that occurs when throat muscles relax, and central sleep apnea, which occurs when your brain doesn't send proper signals to the muscles that control breathing. Additionally, some people have complex apnea, which is a combination of both. Apnea is a common disorder in which you have one or more pauses in breathing or shallow breaths while you sleep. 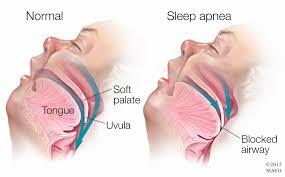 Apnea usually is a chronic (ongoing) condition that disrupts your sleep 3 or more nights each week. This results in poor sleep quality that makes you tired during the day. Apnea is one of the leading causes of excessive daytime sleepiness. If you have these symptoms please consult your physician and ask him/her about getting tested for apnea. * Increase the risk for high blood pressure, heart attack, stroke, obesity, and diabetes. * Increase the risk for or worsen heart failure. * Increase the chance of having work-related or driving accidents There is increased legal liability with apnea due to increased accident prone behavior if the apnea is not treated. If you are diagnosed with sleep apnea and do not use the therapy, you can be held legally responsible for accidents you are involved in. If you are diagnosed with apnea and you are compliant with therapy and not sleepy, you should be able to drive and operate heavy machinery. There are numerous patients who are truck drivers, bus drivers, pilots, air traffic controllers, school bus drivers, etc., who are doing well with sleep apnea treatment and have no employment issue concerning sleep apnea. The NTSB is advising that medical experts question truck drivers about apnea, and has sent a letter to the FMCSA about this recommendation. A task force of medical experts is calling for new screening procedures for obstructive apnea among truck drivers of commercial vehicles. I was diagnosed with apnea and now wear a CPAP mask at night. It does take some getting use to but it has helped me. I no longer have to get up at night to urinate. I awake after getting a full night of sleep and I'm no longer tired all day long. Most people with apnea don't know they have it. Ignoring it could put your life and those around you at risk. If you have any of these symptoms and think you might have apnea talk with your doctor and get tested. Most insurance will pay for the sleep study and the CPAP mask. It is well worth it. And it may very well save your life. Tell us your story about sleep apnea. Do you have a story about sleep apnea? Share it! Your comments or story about sleep apnea good or bad is welcomed here.